FROM printing corporate logos on diaries in the late 1960s, Wangi Industrial has continually innovated to transform itself into a high- tech manufacturer. The forward- looking family business is now a provider of high-quality surface finishing, technical glass, precision optics and optical thin-film coating solutions. Vice-president of business operations Chew Ker Yee, 37, said Wangi started by printing diary covers out of a garage in 1968. The business was founded by his father, Wangi's managing director Chew Yeow Teng. The company provided electroplating services for the battery industry in 1978. "In the early 1980s, we started doing silk screen printing and pad painting - printing on plastic and metal," the younger Mr Chew added. Around 1990, Wangi started to assemble computers. When it lost the deal years later, Mr Chew's father started a new business making glass furniture. Coincidentally, Hewlett-Packard was seeking a supplier of glass for its scanners and printers. Hence in 1997, Wangi ventured into glass processing and pioneered the manufacturing of high capacity, low-cost thin-film coated glass in Singapore. Now it specialises in the design and manufacture of optical components and optical thin-film coating for use in computer peripherals, consumer electronics, point- of-sales and ATMs, imaging and flat-panel displays and analytical instruments. It has manufacturing facilities in Singapore and China. Mr Chew said Wangi may be decades old, but it still behaves like a start-up. Trained as an architect, he practised briefly as one before deciding to join the family business in late 2001. 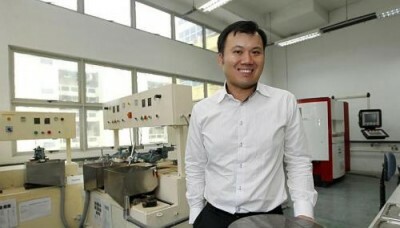 The go-getting man took up a course on Six Sigma, convinced that the manufacturing management method would help Wangi. Years later, after further research, he adopted a different model inspired by the Toyota production system, sometimes referred to as a lean manufacturing system. Mr Chew said Wangi has been leveraging on technology, with his father a firm believer in automation to raise productivity and quality. Wangi used to seek technology from its customers and machine makers, but that did not get the company very far as both groups were not inclined to transfer technology to others. A turning point came in 2002 when Mr Chew visited an open house by the Singapore Institute of Manufacturing Technology (SIMTech), a research institute of the Agency for Science, Technology and Research (A*Star). Despite his father's reservations about losing know-how and trade secrets to a third party, Wangi went ahead to second a researcher from SIMTech in 2003 for a two-year term. The researcher helped the company to locate a start-up machine maker in Italy, which provided computerised equipment that Wangi modified to grind glass to the desired complex geometry and precision that customers sought. "The innovation enabled Wangi to gain at least a year's head start in the new market for complex 3-D optical mirrors for use in high-end medical scanners," Mr Chew said. He said that by 2005, it was clear that Wangi needed to collaborate with research institutes to come up with faster solutions to satisfy its customers. This led it to work with SIMTech on many smaller technical projects. Mr Chew undertook what he described as a "bold move" in 2009 to outsource innovation, contracting a research institute to develop technical solutions after a customer asked Wangi for a specific type of coating. Although that exercise failed to produce the desired technology after more than two years, it refined the company's research strategy. Despite the setback, Wangi did not give up working with others in its quest to develop the next generation of protective coating based on nanotechnology. Mr Chew said Wangi pursues innovation through what he calls the collaborate-and-develop method. "Traditionally, we collaborate only with our customers and machine suppliers. Now we collaborate more with external resources such as local universities, government research institutions and Spring Singapore," he said. Wangi then develops ideas and solutions into profitable or refined products based on its engineering, manufacturing and marketing prowess, he added. Earlier this year, the company formed its own R&D team to collaborate with various research institutes and local academics. "We are still working with institutes like Data Storage Institute (DSI) and the Institute of Materials Research and Engineering (IMRE) because they have the equipment that can do the measurements for us," he said. Both DSI and IMRE are A*Star institutes. With research and development activities being a huge challenge for small and medium-sized enterprises (SMEs), he is grateful that for every dollar that Wangi invests in manpower for R&D, the agency provides $2.30 in grants. Advising SMEs, he said: "For example, if the customer wants a cheaper, smaller and more reliable controller for a machine tool, then that is the starting point for setting up R&D projects. And don't be afraid to explore beyond your principal product area for R&D projects."